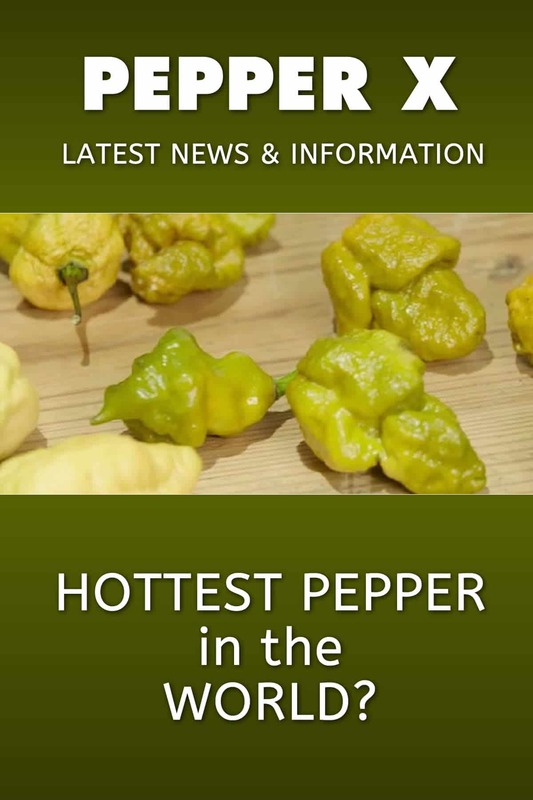 Get the latest news about Pepper X, contender for the Hottest Pepper in the World, measuring over 3 Million Scoville Heat Units on the Scoville Scale. Updated 2/26/2019. 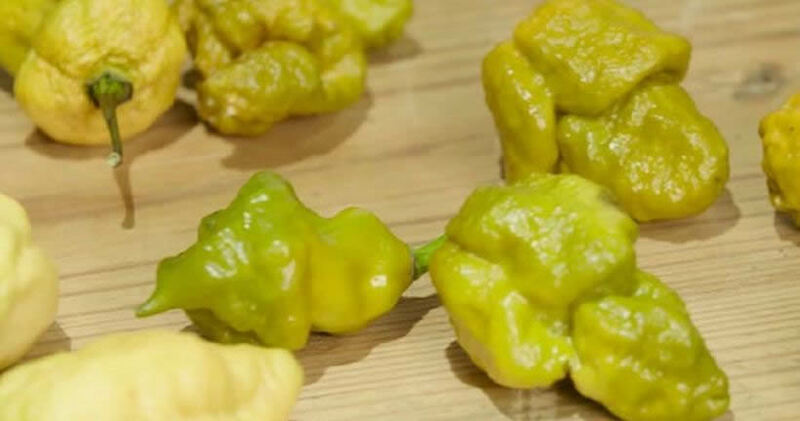 If you’ve been anywhere in the chilehead world lately, you’ve probably already heard about the new “Pepper X”, a contender for the Hottest Chili Pepper in the World. Like you, I am eagerly awaiting more news and information about this pepper, and here is where I will share what I have learned thus far, and will update as new information arrives. “Pepper X” is the temporary name for the chili pepper bred by Ed Currie of Puckerbutt Pepper Company, the same man behind the creation of the Carolina Reaper. According to Ed, he crossed multiple peppers to achieve a pepper hotter than the Carolina Reaper, the current hottest, which measures over 2 Million Scoville Heat Units, with an average of 1.9 SHU. He has spent 10 years developing this pepper. How Hot is Pepper X? While unconfirmed officially, some reports put it at 3.18 Million Scoville Heat Units, well above the Carolina Reaper. For comparison, the Carolina Reaper measures in at 2,200,000 SCOVILLE HEAT UNITS (SHU). The Bhut Jolokia (aka Ghost Pepper), measures in at 1,001,304 Scoville Heat Units. A typical jalapeno pepper averages about 5,000 Scoville Heat Units. Is Pepper X Officially the Hottest Pepper in the World? There is currently no official word, though word is expected possibly by this summer (2019). The pepper has been sent out for testing. However, I was personally told word would come by summer of 2018. I have heard no further word on this yet. What is the Current Hottest Pepper in the World? The Hottest Chili Pepper in the World is currently the Carolina Reaper, which measures over 2 Million Scoville Heat Units. Learn more about the Carolina Reaper here. While we’re not currently able to taste test this pepper for ourselves, you can purchase a hot sauce called “The Last Dab” made with Pepper X peppers, which is a collaboration between Ed Currie and The Heatonist founder Noah Chaimberg. Thanks to both Ed Currie and Noah at The Heatonist for sending along the photo and information. I’ll be sure to post more information as it becomes available. Please let me know if you have any questions and I’ll see if I can answer them for you, or find the information to help. – Mike H.
So i seen this etsy page supposively selling pepper x seeds im assuming this is a scam Ed Currie is the only one that has the seeds am i correct? I believe so, Bryce. I don’t believe anyone is authorized to sell Pepper X seeds other than Ed Currie’s company. Any news on when and where we can get the pepper x seeds? I have an email out to Ed asking for an update. I hope to hear back soon. I don’t see any of the seeds available yet through their site. Any updates on this chili? I would love to try one raw!!! Hey, Steven. Still no word! I see them promoting sauces with the pepper, but still no word on anything official. Eagerly awaiting. Ed is a great PR machine. Made millions out of the reaper and will make even more with the pepper X. Personally I like the heat and flavour of the Moruga chilli. I do like the Moruga. This all seems very sketchy. It’s very unusual that they haven’t let anyone test the actual pepper and that no one has ever received a single pod (even seedless), let alone seeds. If they’re trying to monopolize the pepper (which is a real a-hole thing to do), it might make sense not to give out any seeds, but anything anyone has seen of this pepper are a bunch of pics and the hyped-up sauce. Almost a year later, I think it’s starting to smell a bit. It definitely takes time for the overall testing and approval process. I heard we’ll hear nothing until this November, or possibly next April, but we’ll see. Yeah, no. Secrecy would be one thing. Happily continuing to sell a sauce YOU claim to be made from the hottest pepper in the world, WHILE appearing to maintain secrecy about the actual pepper, that just smells like a scam. I make no claims. Just reporting what I’ve learned. Curious to see any actual testing information, which all I know at this point is forthcoming. Does anyone know of a source to purchase the original Last Dab made with the Pepper X? Only luck I’ve had is eBay($99+shipping) or ChillyChiles in Canada at $35/bottle, very reasonable but it’s $75+ just for shipping. Any help would be much appreciated! REPLY: Joe, here is a link where you can purchase it: https://heatonist.com/products/hot-ones-the-last-dab — Mike from Chili Pepper Madness. I really really want pepper x and the sauce as well. Please keep me posted. REPLY: I’ll be sure to post it here if/when seeds become available. — Mike from Chili Pepper Madness. just wondering if you have made any sauces with rosemary, I have a medium rosemary bush and would like to use it. I’m growing thai, habanero and scorpion. REPLY: Philip, no, though many of my recipes can be adapted to include rosemary. I would start by using a small amount, say a teaspoon of chopped, and see how you enjoy the flavor. Add in more or less for future batches to your preference. — Mike from Chili Pepper Madness. Will seeds a/o seedlings be available to purchase? REPLY: Not sure yet, Ray, though I’ll be sure to report it when I hear. — Mike from Chili Pepper Madness. REPLY: It is currently the Carolina Reaper. — Mike from Chili Pepper Madness. I really enjoy your posts, both informative and fun. But what is the hottest chilli at the moment? I believe it is the Dragons Breath, bred I Wales, hence the name. Came in hotter than the Carolina Reaper. REPLY: Keith, at the moment it is the Carolina Reaper. There were no official tests or information released about the Dragon’s Breath pepper. It is believed that one might have been a hoax. — Mike from Chili Pepper Madness. Life is good with hot peppers! Thanks for the info!